After returning from a wonderful week Wisconsin, our kids were bursting at the seams to open the gifts that “Santa” had left under the Christmas tree while we were gone. I could certainly relate, as I was quite anxious to get back to business. Among the many things to do over the next few days are my month-end website update, year-end accounting wrap-up, and preparations for next weekend’s Perfect Wedding Guide Bridal Show at the Scottish Rite Cathedral. But the first priority upon my return was to get back in a wedding videography state of mind to cover Adrianne & Elliott’s wedding at the Indiana State House. We all squeezed onto a shuttle bus for some pre-ceremony photos on Monument Circle with photographer Erin Hession and her crew. Erin, who referred the couple to me, and whose own wedding we had covered a few years ago, was a total sweetheart to work with throughout the day, and her fun visual style was a joy to watch. The ceremony was most memorable for the couple’s exit through a sword arch provided by Elliott’s military friends, punctuated by “Welcome to the Navy, Mrs. Hultgren” and a friendly sword tap to the bride’s, uh, “stern.” The reception was my first in over ten years at the Garrison in Ft. Benjamin Harrison. (Interesting note: My wife lived at Ft. Ben briefly as a toddler before her family settled down in Wisconsin.) I enjoyed a delightful chat with my assistant and buddy Rich Johnson over dinner and then did my best to keep up with the evening’s lively pace as DJ Kent Clem of WSL Mobile DJs kept the festivities rolling along. It just happened to be my birthday (which Kent couldn’t resist announcing to the crowd), and so it was truly a gift to be able to share a special day in common with and work for such a nice couple and their families. 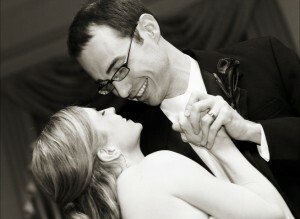 Update (1/2/07): Here’s a fun image that Erin Hession passed along to me from Adrianne & Elliott’s wedding. Thanks, Erin! I’ve been in Milwaukee for the holidays, which has made internet access a little trickier than usual. But sometimes that’s a good thing, as we are enjoying plenty of quality time with each other as well as Chris’ family. I’ll be back in Indy later this week just in time to videotape a wedding on the 29th. Until then, I thought I’d sneak in some long overdue updates. “Hi Bob, Just wanted to write and say that John and I LOVE LOVE our video! You do such an amazing job, so thank you so very much! Our video is beautiful! 🙂 Hope you had a nice Thanksgiving! Last-minute bookings are always nice to get, and thanks to Valerie Crider at the Scottish Rite Cathedral, I had the opportunity to cover Cassie & Chris’ wedding and reception there last night. The ceremony was by far the shortest I have ever witnessed, as the couple was already exchanging vows as I was placing my camera on its tripod immediately after the bride’s entrance. After the candle-lighting and presentation of the newlywed couple, it was over in less than five minutes! The setting for both the ceremony and reception was very elegant, as you can feel the sense history and tradition around every corner at the Scottish Rite. After a couple of hours of dancing in the beautiful ballroom, the couple had a relatively early getaway in a horse carriage ride in beautiful fall-like weather. Wow, has it really been three weeks since my last post? Once the Thanksgiving holiday passed, I saw an opportunity to finish editing the remainder of this year’s weddings ahead of schedule and got a little carried away. I normally try to finish one wedding per week, which would have had me completing our last wedding during the first week of January. Instead, I will be wrapping up the last of our edits today! I can’t remember the last time I was all done before Christmas, let alone with this much time to spare. It’s always nice to surprise clients on the positive side by getting their videos done weeks earlier than projected, and it’ll be even nicer to enjoy the holidays instead of scrambling to complete projects. I might have to do something crazy like sending out cards and shopping this year! I haven’t really talked much about it, but after all these years, this is the first year where I feel like I’ve really “figured it out” in terms of managing my time as well as the studio’s workflow. So in spite of a record year, I’ve actually been able to get home by dinner every night and even take Mondays off. Unlike many of my peers who are working literally day and night, as was I only a year ago, I have my work schedule down to a manageable 45 hours a week. What I never expected was that this additional time off has actually made me much more productive and focused during my time “on.” I can’t mention all this without acknowledging assistant editor Cathy Gerlach, who has been such a huge blessing this year. I still painfully remember the days when I might have had to wait for days or even weeks for my editor to show up! (I wasn’t a very assertive boss.) But Cathy preps these weddings for me faster than I can edit them, which is critical. I also have to thank my long-suffering wife Chris for bearing with me all these years and lighting a fire under me earlier this year to prioritize my life and balance my schedule better. Now, let’s catch up with some highlight segments from the weddings I’ve completed over the past couple of weeks. I’m going to post these as links to the .wmv clips on our server just as I did prior to posting the last few clips as Flash video clips from Google Video. The downside of the Google clips is that they have to be posted as their own blog entries, so I can’t combine them with each other or add them to existing posts yet. It is pretty cool to watch a streaming video clip embedded within the blog though, so I’ll keep working on the ideal formatting and hopefully have it all figured out for 2007. First up is a wedding that Laurie shot for Angela & Marty at the State House, which included a surprise gospel choir performance of a Beatles song. The reception was held at the Westin, complete with burgers and fries for dinner, followed by cookies and milk for dessert. Nice touch! The following weekend, Laurie videotaped Jody & Jason’s wedding and reception at the Bridgewater Club. Jason’s reaction to the officiant’s request during the ceremony for a “token” of their marriage was priceless. Laurie was a trouper that weekend, as we generally try to limit her to one wedding per month due to her busy schedule at WISH-TV. Not only did she work two straight weekends for me, but she also coordinated a wedding on 10/7/06! I have two additional highlight segments completed, but I’ll give the couples a little more time to enjoy their videos before posting those. In the mean time, I’m preparing to be in the first annual Holiday Bridal Show at Allisonville Nursery right up the street, which will be a good warmup for the Perfect Wedding Guide Bridal Show at the Scottish Rite Cathedral in January. I generally don’t do bridal shows, but it’s nice for the business once in a while to get out there and be seen by brides and other vendors. I hope to see you all at the Holiday Bridal Show this weekend! Julie & Justin were married in an emotional ceremony at the Ritz Charles chapel in Carmel, followed by a beautiful reception in the Ritz Charles pavillion. Check out the creative use of apples in the decor, a great idea for a fall wedding! Here’s the highlight segment from Emily & John’s wedding video. Their 9/30/06 ceremony took place at St. Joan of Arc Catholic Church, followed by photos at Holcomb Gardens and a reception at the Montage. This is the highlight segment from Courtney and Zach’s wedding video. They were married 9/23/06 at St. Joan of Arc Catholic Church, with a reception at the Columbia Club. The father of the bride’s reaction to giving away his fourth and final daughter is priceless! See you in St. Kitts! I was honored to be invited by Tracy Heine to her open house at LaBella Bride of Zionsville last night. Tracy and I met as booth neighbors at a bridal show a couple of years ago, and I was immediately impressed with her business smarts and fashion sense, not to mention her sweet demeanor. She’s been great to me ever since, so there was no way I was going to miss her open house. I had a wonderful time there with Tracy, and it was great to see Stacy and Mary and Jessica Strickland there as well. My eyes probably started glazing over when the ladies (I just now realized I was the only guy there) started talking about the gowns, but I can just blame it on that mysterious “punch” they were serving. Anyway, thanks for a wonderful time, Tracy! I’ve always wanted to check out the Premier Bridal Connection weekly open house, so this was a perfect opportunity, since it was right on my way home. Not sure what I was expecting, maybe something like a formal bridal show with fewer vendors, but I was pleasantly surprised by the casual, laid back atmosphere. I can see why this has been such a successful, pressure-free environment for brides to drop in and scope out some truly top-notch services. I’ve only recently gotten to know Jeremy Gearries of DJs Direct, but it’s already obvious the guy has a new idea every minute bursting out of his head. Kind of like me, but with the personality to sell it. The best part, and main reason I dropped in, was to say “hi” to Brandon and Cybil New of B&C Digital Media, since we don’t get to chat nearly as much as we should. I have a lot of respect for them as artists, and even more so as people. I hope they didn’t mind staying the extra hour to chat. It can sure take a while to catch up! Bob, I’ve been meaning to sit down and write a lengthy note to you to express our sincere thanks for the amazing wedding video. We received everything so quickly….I was amazed at how fast you were able to edit our video and ship out the final product. The quality of the video was superb and was not sacrificed in the least for the speed in which we got it. My parents were in town the weekend I received the video, so they were able to see it while they were visiting. Everyone absolutely loved it! I remember way back when I was planning for my wedding and was becoming increasingly more frustrated with some of the sample videos I was viewing from other videographers in the area. The sound quality and the uniqueness of the editing were leaving something to be desired. When I got your email advertising your services I was immediately drawn to your website. I really appreciated how well laid out your website was with pricing information and tons of samples…since I was planning my wedding from out of town. Not only was your unique style what I was looking for, but the finished product was better than I could have imagined. Thank you also for including the rehearsal taping in your packages. I thought it was nice how you came the day before the wedding to “scope things out” and get some of those unique shots that you could have missed if you only came for the wedding itself. In our case, you got some great footage of the stained glass when the sun was shining through, which didn’t exactly happen on our cloudy wedding day. Thanks again for all of your hard work and your professionalism. I didn’t even know you were there for most of our wedding day, yet you captured the spirit of the day beautifully. All of our friends think the video is great and I will not hesitate to refer to you if I know anyone who is getting married in the area. I’m so glad we hired you to film our wedding and our video is truly amazing. We love it! Hi Bob! I wanted to tell you how much we love the video! It really captured the excitement and joy that Eric and I both still remember from our day. It was neat to see how the story fit together on film. You paid great attention to detail, and this video will help us relive the happiest moment in our lives forever! I will definitely be referring IndyVisual to all my engaged friends!